Primary school principals have called on grammar schools to abandon their plans for unregulated tests due to take place later this year. The call came after a meeting organised by the five main teachers' unions. They also called on politicians to work together and agree a method of transfer to remove stress from current primary six pupils and protect the curriculum. The unions want urgent meetings with the education minister and the assembly's education committee. The unions' stance was welcomed by Education Minister Caitriona Ruane. Earlier, Brendan Harron of INTO claimed some schools are being forced to consider abandoning the curriculum to focus on the tests. "INTO has received a large number of calls from principals as grammar schools attempt to place pressure on schools in the primary sector to conform to their proposed regime of academic testing for transfer. "This is forcing schools to consider abandoning the revised curriculum," he said. Mr Harron said the conference in Belfast was the beginning of a campaign to make sure voices of primary principals were heard. 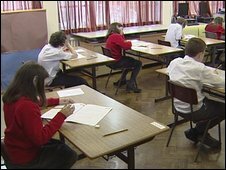 The final 11-plus was held in Northern Ireland's schools last November and the way in which children currently in primary six will transfer to second-level education remains unclear. Some grammar schools have released details of their alternative to the 11-plus.